This paper investigates the modeling and analysis of the sliding passive dynamic walking of a compass-like biped robot with pointed feet. First, we present the passive compass-like biped model and redevelop the inelastic collision equation for stance-leg exchange, taking the impulsive frictional effect into account. Second, we numerically show that two different steady motions, the short- and long-period sliding passive compass gaits, can be generated according to the initial conditions in the presence of the effects of the hip damper and impulsive frictional force. 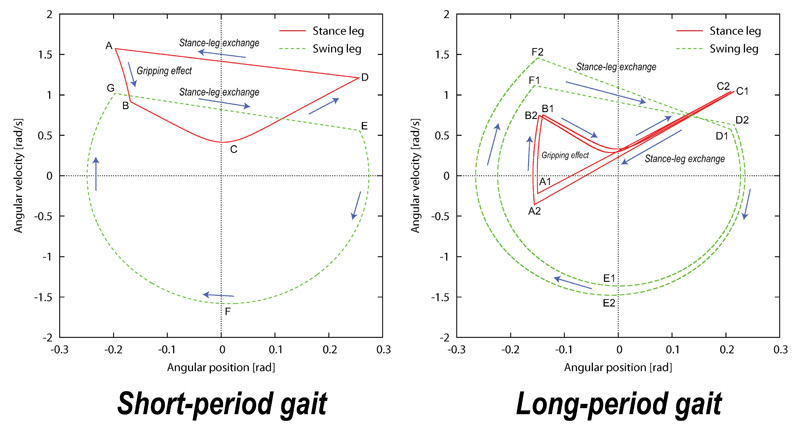 Furthermore, we numerically analyze the change characteristics of the gait descriptors with respect to the system parameters, and we discuss the relationship between the short- and long-period gaits. F. Asano and Y. Harata, “Sliding Passive Dynamic Walking of Compass-Like Biped Robot: Collision Modeling, Necessary Conditions, and Complexity,” J. Robot. Mechatron., Vol.29, No.3, pp. 509-519, 2017. K. Miura, F. Kanehiro, K. Kaneko, S. Kajita, and K. Yokoi, “Slip-turn for biped robots,” IEEE Trans. on Robotics, Vol.29, Issue 4, pp. 875-887, 2013. T. Senoo, M. Takano, and M. Ishikawa, “Dynamic horizontal movement of a bipedal robot using frictional asymmetry,” Proc. of the IEEE/RSJ Int. Conf. on Intelligent Robots and Systems, pp. 1834-1839, 2012. B. Gamus and Y. Or, “Dynamic bipedal walking under stick-slip transitions,” SIAM J. on Applied Dynamical Systems, Vol.14, Issue 2, pp. 609-642, 2015. G. N. Boone and J. K. Hodgins, “Reflexive responses to slipping in bipedal running robots,” Proc. of IEEE/RSJ Int. Conf. on Intelligent Robots and Systems, pp. 158-164, 1995. F. Asano, T. Saka, and T. Fujimoto, “Passive dynamic walking of compass-like biped robot on slippery downhill,” Proc. of the IEEE/RSJ Int. Conf. on Intelligent Robots and Systems, pp. 4113-4118, 2015. F. Asano, T. Saka, and Y. Harata, “3-DOF passive dynamic walking of compass-like biped robot with semicircular feet generated on slippery downhill,” Proc. of the IEEE Int. Conf. on Robotics and Automation, pp. 3570-3575, 2016. C. C. de Wit, H. Olsson, and K. J. Å ström, “A new model for control of systems with friction,” IEEE Trans. on Automatic Control, Vol.40, No.3, pp. 419-425, 1995. A. Goswami, B. Thuilot, and B. Espiau, “A study of the passive gait of a compass-like biped robot symmetry and chaos,” The Int. J. of Robotics Research, Vol.17, No.12, pp. 1282-1301, 1998. J.-S. Moon and M. W. Spong, “Classification of periodic and chaotic passive limit cycles for a	compass-gait biped with gait asymmetries,” Robotica, Vol.29, Issue 7, pp. 967-974, 2011. M. Ohshima and F. Asano, “Underactuated bipedal walking with knees that generates measurable period of double-limb support,” Proc. of the IEEE Int. Conf. on Robotics and Automation, pp. 5643-5648, 2013. J. M. Font-Llagunes and J. Kövecses, “Dynamics and energetics of a class of bipedal walking systems,” Mechanism and Machine Theory, Vol.44, Issue 11, pp. 1999-2019, 2009. Y. Ikemata, A. Sano, and H. Fujimoto, “A physical principle of gait generation and its stabilization derived from mechanism of fixed point,” Proc. IEEE Int. Conf. on Robotics Automation, pp. 836-841, 2006. S. H. Collins, M. Wisse, and A. Ruina, “A three-dimensional passive-dynamic walking robot with two legs and knees,” Int J. of Robotics Research, Vol.20, No.2, pp. 607-615, 2001.